Duration Window’s Grand Design Exhibition Centre is on Canvey Island in Essex, next to the Monico. Post code for the Monico is SS8 7DN. The centre is open 7 days a week! If you wish to come and see our products then please book an appointment, and in order to thank you for booking an appointment we will provide you with a 5% discount voucher. Please try to turn up on time to avoid clashing with other appointments. Here at Duration we believe that it is important to try before you buy and our exhibition centre is unlike any showroom you have ever visited. We do not have salesman nor do we use high pressure, hard sell, sales techniques - we only have friendly advisors who will explain our products and answer your questions. Once you have seen our products, it is much easier to make an educated decision based on quality and value for money. Here at Duration Windows we believe that it is important to try before you buy and our exhibition centre is unlike any showroom you have ever visited. We do not have salesman nor do we use high pressure, hard sell, sales techniques - we only have friendly advisors who will explain our products and answer your questions. Once you have seen our products for yourself, it is much easier to make an educated decision based on quality and value for money. Visit Our Exhibition Centre. Tour Our Factory. Insist on Duration Windows Products. We can get extremely busy so please book an appointment when planning to coming to see our products. We are open most bank holidays and national holidays. Check below for opening times . Please contact the exhibition centre to view our products. For other enquiries such as sales, technical, ordering, dispatch, after sales support or for a quotation please contact our offices and factory. Please note that our NEW Durafold Concealed Hinge, Durafold Slim-line and Continental Flush Glazed Bifold Doors are not yet available to view in our showrooms. Please contact us for more information on these products. By Rail: The centre is approximately 45 minutes by rail from Fenchurch Street. Taxis are available outside Benfleet station. By Taxi: The centre is approximately 10 minutes drive from Benfleet Station. When you leave we can call you a Taxi from the centre. It takes around 18 minutes on the No.21 Bus or 1hour walking to get from Benfleet Railway Station to our Exhibition Centre. Please note: All times are estimated with the use of google maps at off peak travel times. Please note: Please visit the office if you want to go through scale drawings or in-depth technical questions. We have a large centre with lots for you to see and talk about. We currently have around fifty products in the centre. You will want to allow for at least 40min in the centre, when you come and visit. 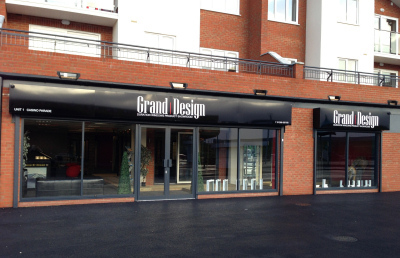 Our local sales office and factory is also on Canvey. If you already have a quotation we advise that you bring it with you. If not we can put together a quotation request on the day. ¹ Children under 18 must be accompanied an adult. Young children must be supervised at all times.